John Douglas Thompson plays multiple roles, most importantly Louis Armstrong, in “Satchmo at the Waldorf” at Shakespeare and Company. LENOX — We’ve all seen them: so-called bio-plays that muster the known facts of a subject’s life so superficially, you’d be better off just consulting Wikipedia. “Satchmo at the Waldorf,” Terry Teachout’s impassioned portrait of jazz pioneer Louis (“Satchmo”) Armstrong — receiving its New England premiere at Shakespeare & Company before heading to New Haven’s Long Wharf Theatre — goes deep. 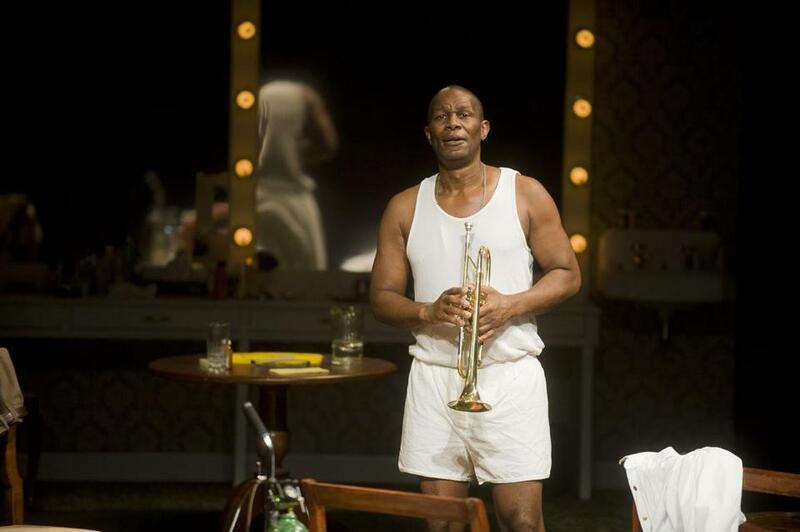 Based on Armstrong’s private tape-recorded reminiscences, which in turn enriched Wall Street Journal theater critic Teachout’s well-received 2009 biography, “Pops: A Life of Louis Armstrong,” this is a true play. It’s shaped; it has forward motion. It also has the extraordinary John Douglas Thompson playing multiple roles: Thompson is not just the fabled hornman at the peak — albeit the sunset — of his career, but also Armstrong’s Mob-connected manager, Joe Glaser; Miles Davis, an undermining rival and successor; and for one brief, shining confrontation, Satchmo imitating his outspoken fourth and final wife, Lucille. “Tour de force” would be an understatement. Thompson, a tall and robust 48 years old, bears no physical resemblance to Armstrong, here portrayed at age 70, in 1971, on the closing night of a prestigious gig at the Waldorf-Astoria hotel in New York. Thompson only occasionally — almost offhandedly, but to brilliant effect — opts to re-create Satchmo’s signature grin and gravelly voice. Yet he gets to the essence of the man. From the evidence (Teachout has extrapolated from the tapes), the genial “Pops” had an interior life in marked contrast to the jovial image he presented to an adoring public. It’s the latter persona that prompted unfair accusations, by next-generation upstarts like Davis, that Armstrong was behind the times, “jumping round like Jim Crow on a stick”; even Dizzy Gillespie publicly labeled him an Uncle Tom. The real Armstrong, whom we get to see and hear here, speaks as the product of his environment: early childhood spent struggling to survive with his prostitute mother in a rough New Orleans neighborhood called “The Battleground”; reform school at 12 (which actually came as a relief); then decades touring venues where he might be permitted to play, but not to eat or sleep. Armstrong speaks as a seasoned roadman might, in vernacular too colorful to quote. From his first utterance (unreprintable here, as is much of the script), we see a man laid low by the humiliations of encroaching age — and also by the latest blow, the deathbed revelation that his manager of 40 years has left behind a will grievously shortchanging him. Ultimately, we learn more about Glaser than Armstrong ever did, and the revelations come as a shock, deep into the play’s dense and riveting 80-minute running time. Less shocking, but nonetheless unsettling, is the extent of the racism Armstrong had to face in his long climb to fame, and the almost inexpressible pain and damage it caused. Aided by director Gordon Edelstein and the consummately skilled Thompson as interpreter, Teachout — in his debut as dramatist rather than drama critic — has contributed a work of insight and power. It’s enticing to imagine Thompson bringing the real Armstrong — the one so few of us knew — to life again and again, over the coming decades.